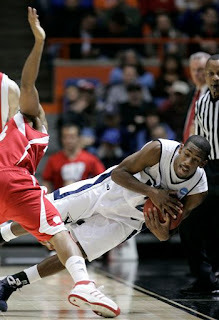 Xavier Too Much For Bucky ~ The Bucky Channel - The World of Sports from Wisconsin's Perspective. Our dreams of a Marquette / Wisconsin final ended a little after 3pm on Sunday, as the Badgers fell to Xavier, 60-49. The Badgers were actually in this one for most of the way against #4 Xavier, even leading at halftime. But Xavier eventually broke away in the second half and keep Wisconsin at bay until the final whistle, leaving the Badgers eleven points short of the Sweet Sixteen. Hats off to the Badgers, regardless, as I didn't think they even had a chance to beat Florida State. It was good to remember that this team isn't as bad as they've played all season, and I'm not too upset with the way this season ended, realistically anyway. In the end, the Badgers were hurt by the same thing they were hurt by all year - not having that one guy to be "the guy". Hughes did at a times, and other guys would step in occasionally, but they didn't have that Alando Tucker kind-of guy. It certainly wasn't Hughes on Sunday, as he went 3 for 16 from the field in a game where the Badgers shot 25 percent in the second half. It was the final game for several Badgers today, most notably Marcus Landry and Joe Krabbenhoft. Krabbenhoft will be thinking about his final game for a long time, and how he didn't score a single point in the contest. Even still, both will be missed next season. Not the best season for Bucky, but not the worst either. This site is not affiliated with, nor endorsed or sponsored by, the University of Wisconsin. Not Every Brewer Game on FSN This Year! How Do We Remember Favre? How Do People Get Here? Will Dan Walsh Ever Forgive Me? Ha. Better Late Than Never I Guess. Buy Your Preseason Tickets Now! Who Is The Greatest Athlete Of My Lifetime? You Think I Don't Proof-Read Well Enough? Where Was The Bucks Post Last Night?